According to the Centers for Disease Control and Prevention (CDC) estimates, this winter’s flu season is on track to be worse than that of the 2014-2015 season when 34 million Americans got the flu, 710,000 were hospitalized, and 56,000 died (The New York Times, January 26, 2018). Newsweek reported that schools in at least 12 states have closed for some period of time due to the flu. Over the past 34 years, February has been the most common month for peak flu activity. 1. The influenza virus lives longer outside the human body when it is cold and dry, resulting in the flu season starting in late fall as cold air reduces the absolute humidity of the air. 2. Vitamin D levels tend to be lower in winter. 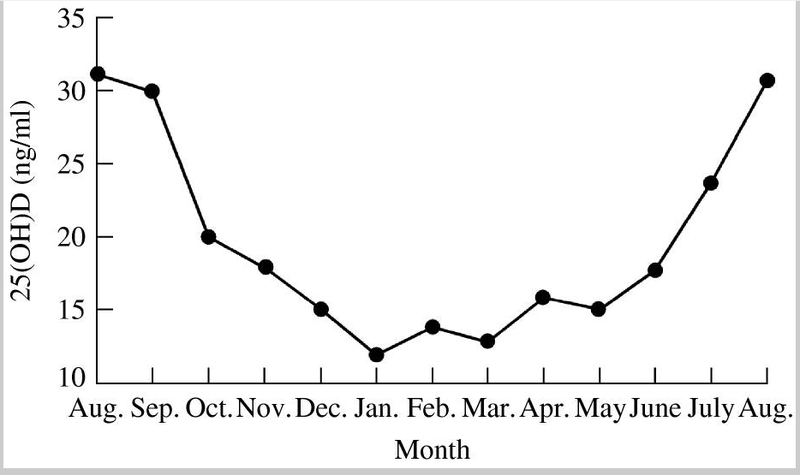 Below is figure 3 from the research paper, “Epidemic Influenza and Vitamin D,” which graphs the seasonal variation of vitamin D levels of inhabitants, aged 50-80 years, of a small southern German town. Most likely you live in the United States or Canada, so maybe you think this doesn’t apply to you, but it does. The average vitamin D level of Americans is approximately 24 ng/ml. 48 scientists agree that optimal vitamin D levels are 40-60 ng/ml (100-150 nmol/L) – neither the members of the German town represented in the chart nor the American average is anywhere near that number. The good news for D*action participants (people who test their vitamin D levels, educate themselves on the benefits of vitamin D, and take action through supplements or sun) is that they are more likely to be above this threshold of 40 ng/ml (100 nmol/L) than the general US population. How could vitamin D stave off the flu? In the paper, “On the epidemiology of influenza,” authors suggest that vitamin D reduces the risk of influenza infection likely through induction of another molecule, cathelicidin, which activates genes involved in immune defense. This is explained in the section – Vitamin D, innate immunity, and influenza. Is the flu vaccine the best way to protect against the flu? CBS News reported in December 2017 that this season’s vaccine may be only 10% effective. As you may already know, being vaccinated is not a guaranteed way to avoid getting the flu. 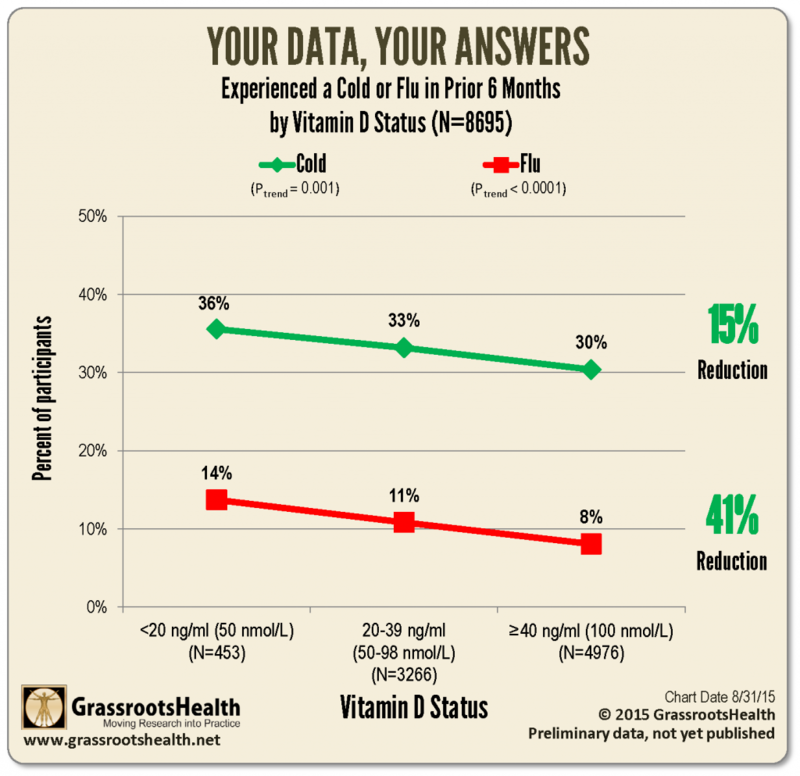 A 2015 analysis of D*action participants showed that those who raised their vitamin D level to the recommended 40 ng/ml threshold or above were 15% less likely to get a cold and 41% less likely to get the flu. That vitamin D is effective in reducing the risk of the flu has been demonstrated several times in randomized controlled clinical trials. The first one was the post hoc analysis of influenza and colds developed by postmenopausal African American women living on Long Island, NY. At the start of the trial, the average vitamin D level was 19 ng/ml (47 nmol/l). During the three year study, there were 30 respiratory tract infections in 312 person-years on the placebo, eight infections in 208 person-years on 800 IU/day vitamin D, but only one case in 104 person-years for those taking 2000 IU/day. The achieved vitamin D level of the placebo group did not change significantly throughout the study, those given vitamin D had an average level of 28 ng/ml after 3 months at 800 IU/day, and 35 ng/ml after 3 months at 2000 IU/day. Compared to the placebo group, those taking 2000 IU/day saw a 90% reduced risk of respiratory infections! A trial in Japan involving 167 school children aged 6-15 years taking 1200 IU/day or a placebo found those children taking vitamin D had a significant 40% reduced risk of influenza A infection (no effect was found for influenza B). However, for those who had not been taking vitamin D prior to enrolling in the trial, the reduction was a significant 64%. Unfortunately, starting or ending vitamin D levels were not measured in this trial. These measurements are important as there is a six-fold variability in vitamin D levels based on supplement amount. More recently, results of a trial conducted in Canada with children 1-5 years old with a starting average vitamin D level of 37 ng/ml and a 22% influenza vaccination rate found a significant 50% reduction in influenza virus infection for those taking 2000 IU/day vitamin D compared to those taking 400 IU/day. At the end of the study, after the dosages took effect, the control group remained at 37 ng/ml and the treatment group raised their average level to 49 ng/ml. These first three papers tell us that, in the range from roughly 20 to 50 ng/ml, as vitamin D levels increase, the risk of influenza virus infection decreases for children and the elderly. Vitamin D is also effective in reducing the risks of other acute respiratory tract infections. A systematic review of vitamin D clinical trials involving over 11,000 participants found that those in a subgroup taking daily or weekly vitamin D supplements had a significant 19% reduction in acute respiratory tract infections, but for those with baseline vitamin D levels of 10 ng/ml, the reduction was 70%. There is good recent evidence that higher 25(OH)D concentrations are associated with reduced risk of community-acquired pneumonia (CAP). Researchers analyzed data from the NHANES III dataset. Using both self-reported data on pneumonia, “During the past 12 months, have you had pneumonia?” and vitamin D levels for approximately 17,000 adults, they found that those people with vitamin D levels less than 30 ng/ml (75 nmol/L) were 56% more likely to develop pneumonia than those with levels of 30 ng/ml or higher. A study of people 43-77 years old, living in Colorado, found that having vitamin D levels less than 15 ng/ml (37 nmol/L) was associated with a 2.6 times higher risk of developing community-acquired pneumonia. A study involving children 3 months – 5 years old living in Guatemala found that those children with vitamin D levels less than 20 ng/ml were 2.4 times more likely to be hospitalized with pneumonia. A study of adult Norwegians, average age 66 years, found that vitamin D levels less than 12 ng/ml (30 nmol/L) was associated with a 1.9 times greater risk of death from community-acquired pneumonia as compared to those having a vitamin D level greater than 20 ng/ml (50 nmol/L). In a study on the 1918-1919 pandemic influenza, which was a type A strain, case fatality rates were significantly lower in U.S. states in the south and west, which have higher UVB doses in summer. While the topic of this blog is the prevention of flu and respiratory tract infections, there are many more benefits of vitamin D including reduced risk of many types of cancer, cardiovascular disease, type 1 diabetes, multiple sclerosis, and adverse pregnancy and birth outcomes. Test your vitamin D level today! After you receive your results you can determine how to best proceed, with sun or supplements, to raise your current vitamin D level above 40 ng/ml (100 nmol/L). You can use this calculator to help you determine the approximate amount of EXTRA supplementation required to get to your desired level. It takes about 3 months for a change in your vitamin D regimen to reach a new steady level in your body. Similar to dieting, you need to ‘step on a scale’ to see if what you are doing has made a difference. 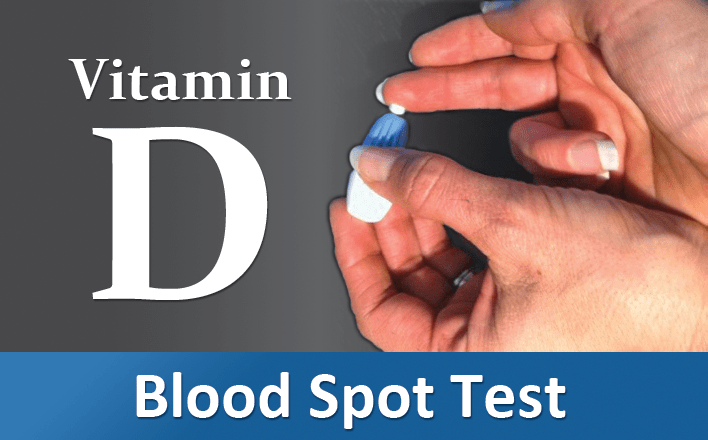 With vitamin D this scale is your at-home blood test. Test again and see whether your new regimen worked perfectly, not enough (need more), or too much (need less). There is a six-fold variability in how different people respond to a particular supplement level. 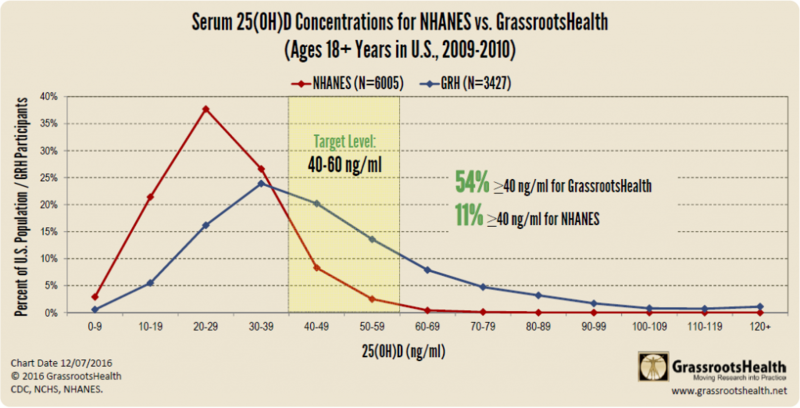 That is why GrassrootsHealth never recommends a supplement dosage and always strives to report research data based on achieved vitamin D levels. John J. Cannell et al. Adrian R. Martineau et al. Sadeq A. Quraishi et al. Anna J. Jovanovich et al. Jan C. Holter et al.